After taking a critical look at my original post I realize that it’s likely to offend the non-helmet-wearing-serious-cyclist crowd, by implying that all serious cyclists wear helmets. Oops, I didn’t mean to do that. I was proposing a possible typical response from a non-helmet-wearing-non-serious-cyclist perspective. I offer apologies to the non-helmet-wearing-serious-cyclist crowd. Not Responding offered some statements comparing the likelihood of head injury by walking vs biking. Mmmmm…statistics! Here is an indisputable fact: I have never suffered a head injury or any other type of injury requiring professional assistance because of a walking mishap. I have suffered two head injuries (one was exceptionally nasty) due to bicycling accidents. Woody (good to see you found me woody!) offered this "I don't believe it is your right to tell me what I should and should not wear when I'm biking” as reasoning for not wearing one. This seems profoundly illogical to me and I hope that they are able to articulate less reactionary reasons like the weight, heat, vision, the wind in the hair or even tradition. I’d vote against legislating helmet use, for the same reasons I’d vote against legislating morality. Toward people that I don’t know that I see riding without helmets I have no ill thoughts or feelings. Toward my friends and people I have relationships with and people who ask me about cycling, helmets are the first accessory they need. Toward people I ride with…I don’t normally ride with people that don’t wear helmets. Toward John Thune…he’s a public figure, he’s fair game. There’s plenty more I wish he’d do differently. I’ve previously posted my political leanings so there shouldn’t be any surprises there. Besides, it gives me an opportunity to suggest that I see him riding around the neighborhood, which is strange because he's on the short list for next POTUS. US Senator and 2008 presidential possibility John Thune rides bike without a helmet. It’s probably because he’s not a serious rider. Everybody knows you don’t fall off you’re not doing serious cycling. Has Anybody Seen My Training Ride? At the beginning of the day I was set to leave work early and grab two hours of sweet bike time before heading off to swimming lessons. The ride was going to include what little urban singletrack there is in this town, and I was going to do it on the under utilized race bike. 1. Spoke-n-Sport – another water bottle filled with the sweet goodness of Lemonade Gatorade, a bell for The Boy 3’s bike, new cheap grips for the trail-a-bike. 2. Best Buy – the very guilty pleasure of the new Ying Yang Twins CD, and the Audioscrobbler inspired purchase of Breaking Benjamin. 3. Target – we’re looking for an in-car refrigerator. Summer road trips and The Boy’s food allergies don’t mix well. I was just looking not buying. Sheesh…I don’t have a 12 volt outlet on any of my bikes. 5. Home Depot – siding repair materials. The man talked me out of $100(?) worth of metal strips, and talked me into $3 worth of caulk. Thanks man. The on-bike temperature was 82 for most of the ride. That’s 20 degrees cooler than the numbers my thermometer has been showing me for the past few days. Nice. HOURCAR, a car-sharing service, begins in the Twin Cities. The Star Tribune has an article and the organization has a website – www.hourcar.org. But are the citizens ready? Faith School District is cash strapped and in trouble. The state fire marshal ordered the school closed, there's no money for a new building and they're too remote to merge with a neighboring district. They’re installing anemometers in hopes of building and owning a wind farm. In 1977 Disney released The Many Adventures of Winnie the Pooh. Winchell was the voice of Tigger, Fiedler was the voice of Piglet. I wonder what Eyeore thinks of all this. Until Friday I was going to make the < 10-mile week. I had even had a plan in place to pick up and transport the whole family to a wedding without my car. But then The Boy 3 got sick. I took care of him in the afternoon, and at the end of the day I had to pick up The Boy 7 from daycare, get them fed, and get to the wedding…all in my car. Thursday we were shopping at Target. We found the cold medicine shelves cleaned-up empty; nothing there. Apparently in an effort to reduce the Meth Lab supply chain, you need a note from mom to purchase cold medicine at Target. Oh, and you need a pharmacist in the house too. So we went home without Pseudoephedrine. 1. The Chuck Taylor clad wedding party. Groomsmen in black, Bridesmaids in blue. Someone at work saw me get off the bus last week. She happened into our workroom and asked about it. A teammate turned and said, "YOU RIDE THE BUS?" Good times. Let the wonderment begin. He's wanted a bike to ride around like his brother and dad. Last weekend he got one. A pedal doesn't go around very well. By his second ride he was lifting his foot off the pedal at the top of the stroke and catching the flat side of the pedal on its way down after it flattens out. Over the weekend he was playing the piano by hitting two fistfuls of keys repeatedly and singing a classic children’s tune. At one point I listened as he switched the key he was singing in to match the dominant key he was playing in. If I Break the Routine Does Something Else Have to Break Too? I caught a ride with my wife to work today because I needed to bring water and I wasn’t doing very well with timing to catch the bus. This scenario fits the MinusCar ideal because it’s not really out of the way for her trip to work. As she was driving away after dropping me off and I was locking up my bike, I realized not only did I not have my keys, but also I had left them on top of the car for the drive. So I got on my bike and went downtown and retrieved them from the top of the car. A dad, and my former neighbor, while picking up his child from daycare Monday commented that it was too hot to be bicycling. He was right it was hot. The heat index at the time was 103. One of the great things about this town is that it’s still small in a lot of ways. For example, there’s Socrates. He first caught The Family’s attention by blasting classical music from his Outback while dropping his child off at elementary school. Since then I’ve had the pleasure of noticing him and his family at a couple community events, with his hemp clothing and his flip-flops. This yellow new beetle with the flower vase on the dash, the peace sign sticker on the left and the Grateful Dead sticker on the right, completes the package. Thanks for coming by SOCRTES. I’ve begun to bicycle to downtown to ride the bus home. This offers several advantages over catching at work. 1. The downtown departure time is fixed so it’s easier to catch. 2. I can leave work a few minutes later. 3. I don’t have to sit outside work at a bus stop and wait. Sitting and waiting at on street bus stops continue to make me overly self-conscious, especially near my place of employment. Monday I rolled down the middle of the lane on a narrow central downtown street in a 15mph zone as I was approaching a red light. The driver of a tan Jeep Cherokee (1MA 689) that was behind me demonstrated their willingness to risk my life, their property, and their disregard for the law, by crossing a double yellow line to zip around me and get to the red light first. Coincidentally this was the same red light that riding buddy Chad and I had a confrontation with a driver this spring. That involved actual property damage to the vehicle, as well as a ticket to the driver for passing in an intersection. I was early to catch my bus so I followed the Jeep and waited behind it at the next red light, and then I waited behind it at the next red light before we went our separate ways. On a positive note, I’m pleasantly surprised that it took so long before having a bad experience with a driver. Batman Begins – more liberal media Hollywood elite ideas being shoved down an unsuspecting public’s throat, which is to say I loved it. Justice and compassion seem like such quaint notions these days. My least favorite part was the first Batmobile chase scene. It was twice as long as it needed to be. KT picked me up for the trip to the movie, which uncovered a problem with the MinusCar Project. It was my turn to drive. I should have driven. But to pick him up would have required a single occupant trip to his house. He knows about this project and he offered to pick me up, but something needs to change. I could require in that situation that he drive to my house and I drive from there. I could require that to go out like that we would transport by bicycle or bus to my house or the event. I could adjust my rules to allow for single occupant trips to pick up a passenger on some occasions, especially when the net miles will be similar. If I did this I’d get to keep more of my friends through this project. Not the Florida Gator’s…I’m talking about John Deere Gator’s. 1 – as The Boys and I sat in the grass enjoying our lunch a Gator pulled up near us to visit with a group of people nearby. As the driver prepared to depart the Gator rolled backward toward us. Someone at a nearby table yelped which alerted the passenger to the imminent problem and the passenger passed the word along to the driver. 2 – as my mom sat on the grass leaning back with her hands behind her the same Gator with the same driver came within inches of running over her hand. The look on the passengers face as they cruised by said it all. The mixture of bicycles and pedestrians on downtown sidewalks is deemed so dangerous that signs are placed prohibiting bicycles. Yet, in the midst of the randomness of a family festival there are inexperienced volunteers driving motorized mini-tractors through crowds of people. Saturday was relatively complex and my transportation needs evolved as the day went along. Because of the fluid plans I ended up wasting a few miles on my car. In the morning I thought I was going to need it at my usual bus stop, but by the end of the day I could have left it home. My dad and I were able to bicycle together to a morning meeting, and then to the annual Festival of Cultures where we met my mom and The Boys. Later The Wife arrived for her work shift at the festival, and The Boys and I were able to use her car for the afternoon, which included a couple stops on the trip home, and then a trip back to the festival to be helpful at the end of her shift. I was prepared and very close to making my first bus trip with The Boys, but the utility of the car weighed heavy. So my car sat at the bus stop until we all returned home at the end of the day. Instead of riding I took the bus home Friday, then got off the bus and picked up the boys at daycare. The trip home was by bike with the trail-a-bike and then the Burley trailer attached. Maybe I should get some "long load" signs for that configuration. All was not perfect though when I realized I had forgotten to include their helmets. There we were, dad with a helmet and kids without on the ride home. Sorry kids, I'll do better next time. There are so many things from this morning I’m putting them down now. 1. I pushed the envelope of home departure. I had resigned myself to missing the early bus, but left home anyway to maybe try to meet it at the later more downstream stop. Instead happily I caught it at my usual stop. 2. I struggled to pull the bike rack down so I had break routine and lean the bike against the bus. As I was doing that the driver lowered the hydraulics nearly squishing the bike as it leaned. I rescued it in time. 3. As I boarded the lowered bus I knocked my head on the side mirror. It was ok though because I was wearing the helmet that I didn’t have time to take off because I had arrived at the stop to late. 4. The head knocking was similar in effect to putting a quarter in the now very chatty driver. Stories he told me: he once knocked a passenger off a snowbank with his mirror, his non-swearing dad once knocked his head and responded, “gracious that’s hard”, he talked about miles per gallon and two car families and why don’t people ride the bus more (I appreciated this topic the most, of course). Then another passenger boarded and they enjoyed some rather paranoid discussion about mystery illnesses and African immigrants. I’ll let the reader draw the lines between those things. I chose not to draw the line between lack of bus ridership and their discussion. 5. At the downtown transfer 15 people boarded. By the time I got off there were close to 20 people on the bus. I’ve never been on a bus that full. People were talking; there was a very nice energy there. 6. The dread locked, bike riding bus passenger from June 9 rode today. I confirmed with the driver that this was the first time she’d had a bus with two bikes on it. I mentioned that it was going to be the first time I’d have to remove a bike with another aboard. The actual unloading was uneventful. The ride home Tuesday was an extended dance remix version and it was sweet. Some days it just feels good to be on the bike. Days like that and wind, rain, and mechanical problems don’t even bother. The wind was 25mph seemingly originating from my home so there was no way to avoid riding directly into it. I tracked four bands of rain as they moved quickly across the sky; none of them got me wet. And two spokes in my rear wheel gave up halfway into the ride, sproing! For that I released the rear brake and finished the ride with front only. Danger! Danger! On the way to swimming lessons we dropped that bike and The Boy 7’s bike off at the shop for repairs and kickstands, respectively. For almost a year now I've recorded the miles and gallons each time I filled up my car. I had been mostly doing it to keep track of my miles per gallon. Using this data I am able to show that for the past year I've averaged 450 miles a month on my car. I've been sad the past couple weeks that my car mileage has been so high, but no more! Halfway through June has me with 82 miles on my car. I'm still striving for a below 10 mile week, but I seem to be on a pretty good pace to cut my car usage in half, and I'll only get better! It was a pretty great weekend! Saturday I did a round of disc golf with KT & DDD. Wet grass led to wet discs which led to wet throws which resulted in very poor scoring. I finished in the middle with 65. My current 10 game average is 54.10. Later I drove The Boy 7 to a birthday party. To avoid the single occupant trip home I took a 2 hour bike ride around the trail on the single speed. (Free your left brain, ride single!) On the way home we visited the boys at the LBS. I was pleased to find that my recently damaged bike was finished and my bicycle quiver was again at full strength. Those guys are too good to me! Seriously. At the end of the day Saturday The Boy 7 and I rode bikes to the local convenience store for Gatorade in preparation for my Sunday ride. It was the first utility trip for him and his longest ride yet. Sunday I put 50 miles on the road bike with the Houseperson. The weather was extraordinary with 52 degrees and very little wind! Remarkable considering what’s been going on with the weather. We were able to view from afar the 50 hot air balloons in a race that was able to get off the ground after trying twice Saturday. That was a pretty site. It was a 70 mile weekend (not including utility trips). Between all the recreationing, at home we nearly completed a landscaping project. All we need are some perennials (yellow Coreopsis and some Autumn Joy), and some grass to grow. I might have pictures after we get the plants installed. Bike Rack Usage: from May 31 to June 8 the bike racks on the busses have been utilized 58 times. I figure I probably account for a third of them. Not normally at least. I previously said that they forgot to invoice me for my montly bus passport. I guess they invoice at the end of the month. My bill came. I will pay. I’ve received a few comments from people who’ve already given up their cars. One came from a guy in England where gas is $7/gallon. The Oil is for Sissies guy sent me his regards, and I’ve been reading about his exploits since. Thank you, I very much appreciate the encouragement. Plenty of chatter centered on the water problem. I think I’m into a groove now where that problem is solved. Someone suggested the Xtracycle but I’ve got my eye on a BOB. But still, at 40lbs I’m not transporting 5 gallons of water any distance by bicycle. Someone wondered if Kory and the Fireflies wrote the Happy Song. No, that was Janitor Bob and the Armchair Cowboys, a much better band in my opinion. And for a limited time only – gone. And finally the Fat Cyclist was paying attention to his referrers and found me; and that makes me smile. Fat Cyclist races the Leadville 100 which I’ve had my eye on for many years, but I may never do it because while he’s the Fat Cyclist, I’m the much fatter cyclist. And his Political Compass is scary similar to mine. There's a big state bike ride next week. I noticed in the local daily the fairly typical misunderstanding that anytime there's a group of people riding bikes it must be a race. It's a simple mistake to make, especially because there are always a certain percentage of the participating cyclists in any group ride who also think it's a race. But this is an especially interesting mistake because it’s the local daily’s ride. Apparently those kids over there at the weekend magazine desk missed a memo from marketing. Driving For the Sake of the Car and Oops, I Did it Again! My car needs an oil change. 3 months or 3,000 miles, and I always do whichever comes last. I had to drive today because they ain’t coming to my house to change the oil are they. I have to drive again tomorrow too because the wife’s car needs a change, and a tire fix and a headlamp. At least I know that the next oil change for my car will be sometime close to never (hopefully). Today I did it again, and this time it’s very sad. I’ve got 10 or more years experience driving with a bicycle on the roof of my car. You know where this is going don’t you? Before March I had never tried to fit a car with a bike on it into my garage. Today I tried again. I guess if at first you don’t succeed, you might as well be an idiot. Last time the bike rack took the damage. This time I manually adjusted the fork and the handlebars and it still wouldn’t fit. It looks like I’m in the market for a replacement fork and maybe some other parts. At least I already have to drive tomorrow; I can deliver the damaged goods to Chad in the morning. Hey Chad, do you have any 10 year old green Timberline forks lying around? 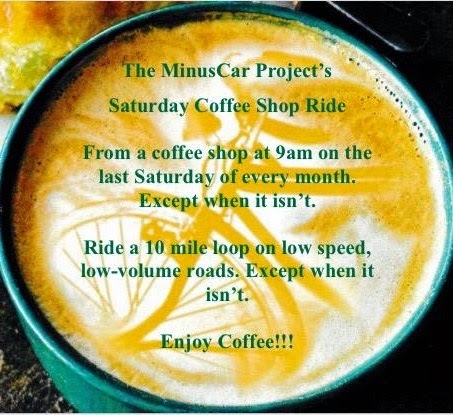 Project MinusCar continues tomorrow with the single speed. Sigh. I took the Political Compass Test. I'm -3ish on both axes. A popular place to be these days for sure. I walked out of work and as I was waiting for the traffic control to allow me to cross the street I could see the bus up the road. I began calculating the necessary risk involved in catching that bus by any means necessary, but everything ended up fine. That’d be a heck of a way to miss a bus though. If I extend my bus ride on the route I take home it includes a small loop in shopping central. The loop happens to encircle a post office where I frequently go to empty a PO Box. I did that loop recently to test the timing. I would have just about 2 minutes to depart the bus, ride to the post office, get the mail, and ride another block to re-catch the bus. I wonder if the driver would find that annoying. Someday I’m going to try it. Two Days of What to Do at Lunchtime? Interestingly my dentist was especially concerned for my safety on the roads. He commented as we discussed my biking attire for the office visit, and he offered a follow-up word at the end of the visit. FRENCHE – on a new beetle and some bus passengers commented on it too. I drove my car 29 miles last week. That’s unacceptable to me. I’m wishing for less than 10 at least. Next week I’ll have official scoring. It will include three numbers: trips with no car, trips with car, and trips as a single occupant. On the ride home Tuesday we picked up a dreadlocked guy with a bike. This marks the second time I’ve seen a bike on a bus, but more importantly the first time I’ve been on the bus with somebody else’s bike on the front. If only my bike was along for the ride. The rack would have been at full capacity…woe to bike rider number three who would have to wait for the next bus. I wonder how long before that happens. Wednesday the daily had a small photo of a bus with a bike on it announcing the existence of the program. The transit city planner suggested in the article that many people had requested the racks. I should say that there have been at least a handful of people with bikes walking through the downtown bus depot which would suggest a few of them had either recently been taken off a bus, or will soon be put on a bus. Tuesday the National Weather Service was calling for Severe Weather developing in the late afternoon including the possibility of tornadoes. I suppose data exists that suggests I’m more likely to be killed by lightening than to be killed by a tornado, but I’m more worried about serious injury, so I’ll keep my unhealthy fear of tornadoes thanks. Rain was also expected in the morning so I chose to put into practice what I had learned from the previous Friday. I drove to my local grocery store and staked out a nice view of the bus route and parked my mobile bus shelter for the day. While I waited I purchased a copy of the local daily and a latte. I was set. 1. The mobile bus stop idea works. 2. Previously I never had time to read the daily. Now I can read it on the bus. I have since re-subscribed. 3. This is a way I can handle the office water problem…maybe have the wife drop me at the store on her way to work, or drive the 2 miles myself if I must. Problem resolved. I also learned that I might want increase my risk with the weather. Yes it rained slightly but not too much as I waited in the morning, and by the end of the day the NWS had lessened the predicted severity and delayed the start time of the evening weather event. It arrived at 1:30am the next day. I could have been home by then easily. Not long ago I bought a SoundBridge. I’ve been frustrated with it loosing its connection to the music library. It’s been down probably 80% of the time I’ve had it. This weekend I became frustrated enough that something needed to change. I pulled out my old laptop with the broken screen, installed the free VNC remote desktop software, and in remarkably short time had replaced my SoundBridge with something that was broken AND wouldn’t be such a hassle. Now hiding on top of the kitchen cabinets is a closed laptop connected to small speakers and my home network running WinAmp connecting to my mp3 library. I control WinAmp from my desktop PC through VNC. Satisfaction!! Sorry SoundBridge. Maybe in a few years you and Windows Media Connect will be ready to actually sell a product that works. When that happens, give me a call. Weekends are the worst, although most of the driving is performed with a car full of family. I keep holding in my mind the idea that some day we’ll take a bus trip together. Saturday evening/night was a special single car occupant failure. Kassie e-mailed me and said the key to avoiding cars is to always plan ahead. Like Friday much car driving could have been avoided if I had given it enough thought. I met KT at RibFest! It was a bit of a spontaneous meeting. He was there with his family. His wife was heading home with the kids and I was to meet him and we’d watch the band Kory and the Fireflies. I hung up the phone and began thinking about what I’d need to ride my bike there. Luckily I fully realized that if I rode my bike KT would have to walk home. So I drove. RibFest! is one of my favorite annual events. I like the barbeque, and this is the perfect place and setting (almost) to enjoy it. It loses a few points because the event is held in a parking lot; sometimes the idea of eating ribs in 90-degree heat on parking lot asphalt isn’t very appealing. But Saturday it was not 90. I went right to Desperadoes and ordered up the platter, which involves probably 2lbs of meat. After not finishing that, we found a nice place to stand and view the band. I’ve never seen Kory and the Fireflies before. They play a nice family friendly brand of rock and roll. The sort of thing Budweiser would sponsor, which they do. I enjoyed the show. Kory explained that he's been hanging out with U2. He told us about the "One" campaign which has something to do with Bono. It wants to end world poverty. Kory suggested everyone should be able to eat. I'm thinking there could be a campaign, "One" to end gluttony. Think of it: ONE serving, maybe just ONE pound of ribs. Or how about throw away just one food item on the plate. On the way home I asked KT about sump pumps and wet basements. At our house we’ve pumped water from our basement two or three times in the couple years we’ve lived there, and we had been pumping during the day. Being a new home and all KT wasn’t sure if he had a pump, but he was going to check before sleep. Sure enough, he didn’t have a pump, and his newly finished basement was wet. Ouch. Welcome to new homeownership in our town. New homes should come with stickers: some assembly required, sump pumps not included. In the morning it was raining. I couldn’t imagine standing in the rain waiting for a bus. I drove all the way to work. Once on the bus I figured out how I could use my car as a mobile bus stop by parking it in such a way that I could see the bus coming and minimize the amount of time in the rain. I also need to get an umbrella. While I sat on the bus at the depot this morning I observed a few people highly interested in my bike. One of the other drivers even touched it and gave it a little shake in a mocking effort to test the stability of the bike in the rack. It's a very novel thing these racks on the busses. Today on the way home I joined the bike club's Thursday ride. The whole 3 hour ride ended up at 42 miles, which is pretty slow, but still respectable. There were three new riders tonight. I rode with two of them. They were pretty hammered by the end of the trip. Previously their riding had consisted of 10 miles at a time on the local bike path. This was tougher terrain, plus they took off with the fast group on the way out. I tried to be encouraging and hopefully we'll see them again. One regular attendee rides a trike. I talked to him about the Human Powered Vehicle (HPV) races he had recently participated in. One of the events was a flying start lap on a 3/8th mile track. He averaged 28mph in that event. Sweet. Today my statistics evolved into something that I hope won't be too much work. I'll see. Each time I transport myself from one destination to another I will score a point for the method of transport. The methods will be bike, walk, bus, car and single occupant car. There will be some grey rules for these. Walking will be a point if it's something I would normally have driven or ridden. No points will be scored for walking from the bus to my desk...unless there is some reasonable distance traveled. Today I scored a point for single occupant vehicle. I called my wife for lunch without enough planning on my part. She ended picking me up which I counted as a single occupant car trip because I initiated the meeting. I counted the return trip from lunch as a regular car trip because it was on her way back to work, and she was going that way anyway. I'm a geek by the way. If something can be over-engineered I'll try. Today, I think was the first day the whole bike/bus plan worked like it was supposed to. A 67 minute ride home with the backpack on. I was hoping to get to the bank to get some cash before close, but I was seven minutes late. I could have taken a more direct route but didn't. That gives me something to try for another day. I left a pair of work shoes in a box in a storage room tonight. Tomorrow I'll take the black pair. This evening we went to shopping central to watch Berghorst & Sons move a building. We watched for 45 minutes. They were planning a four hour trip to downtown. It was pretty great free entertainment. The Boy 7 really likes to see stuff like that. He figures out how it all works. Last Sunday our local daily had an article featuring a yet to be approved upgrade to the bus system. A new transfer station is being built near shopping central. As part of that project they’re looking at changing some routes and gaining some efficiencies. The new transfer station will have 22 free parking spaces to enable parking and riding. I reviewed the proposed new routes and a bus will pass within two blocks of my house. This same bus will continue on by The Boy 7’s school. This could work out very nicely for the continuation of the MinusCar Project into the school year. They’re also changing how passengers can catch the bus, by requiring them to wait at a designated stop. Some people won’t like that, but I’m quite fine with it. It clearly defines where to wait to be picked up, which was something I’m otherwise learning through experience…some bad. I’m still not 100% comfortable waiting at a stop for a bus. Finally, a statistic, the report says 700,000 people rode the bus last year. This number is probably double what I would have guessed at the beginning. After taking a few rides I’m able to say that’s about right. I’m don’t think I’ve been on a bus alone since that very first ride I took into downtown.